Happy Monday busy bees - spring is finally arriving! I can't drive anywhere here in Nashville without seeing beautiful blooming trees and I am one happy gal. I'm so excited to be featuring my favorite spring looks with Tobi in this post - these styles are too cute not to share! This spring I'm all about light/warm tones and shooting these pieces was so fun! Doesn't this white wall with the greenery look like it belongs on a little side street in Beverly Hills?? So adorable! 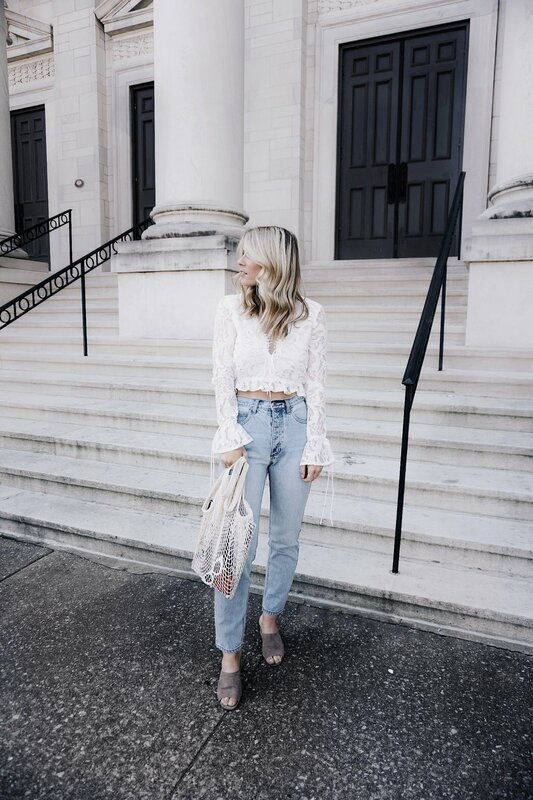 This white scalloped lace top is to die for and it's such a subtle way to dress up an outfit and add elegant details. I paired it with light washed mom jeans and suede mules! Such an effortless outfit, yet it looks so put together (HECK YEAH minimal effort I'm all about it). And can we talk about this wrap dress?! It is the most perfect dusted mauve color and I cannot get enough of it! I wore this with some eyelet sneakers and a woven hat - felt like I was going to play tennis in the Hamptons, but in a cute way. Guess what? Everything on www.tobi.com is 50% until March 21st so get shopping! 1. Seeing all the trees blossom - it's nature's way of saying winter is over and it's so beautiful to watch! 2. Ordering iced coffee - hot drinks are so photogenic but I always prefer iced drinks - my go to is an iced almond milk latte! 3. Concerts and festivals - spring means a lot of festivals and concerts are about to happen and they're one of my favorite things to do! I'm seeing Odesza at an outdoor amphitheater in May and I'm so excited. 5. Daylight - it's so gloomy in the winter when it gets dark by 5:00! I've been loving the extended daylight this spring, it just makes me such a happier person overall! I hope everyone has a productive and sunny week ahead of them! I'm planning out a few new posts that will hopefully be up in the next few weeks (balancing blogging and graduate school isn't an easy task!). Stay tuned & we'll talk soon!